Some time ago I read in the local newspaper that an old run down chapel in Verchizeuil, a hamlet of Verzé, was in such a bad state that the local pompiers had decided to cover the chapel with tarpaulins in order to protect the inside from the elements. 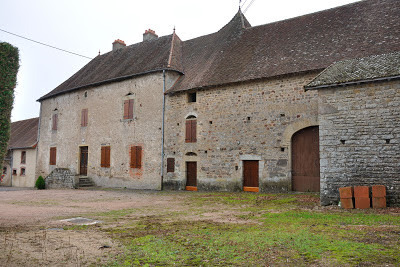 I had never heard of the hamlet, let alone of the chapel, but one day, looking for something completely different, we drove through Verchizeuil; the place name triggered off remembering this newspaper article. Almost immediately after entering the village we saw a sign saying "Chapelle Saint-Criat" to the right, and we decided to follow the sign posted path on the edge of the forest. The path continued, became muddier and muddier, the slopes up and down became steeper and steeper, but we carried on as good as we could. After having plodded about a kilometre through mud and huge puddles we ended up at the foot of a hill. we left the car there, and struggled up hill on foot. The map shows clearly where the chapel is. From Verchizeuil a path runs along the edge of the forest to the south-west. Just after the path starts running through the fields, it makes a bend to the right. At the end of the bend lies the chapel. 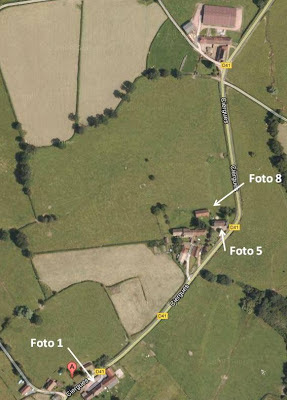 Depending on the settings in Google maps (one can switch the option "labels" on) the chapel (at this moment -2013- on Google maps still without cover) is clearly indicated. The picture dates from before the action of the pompiers. 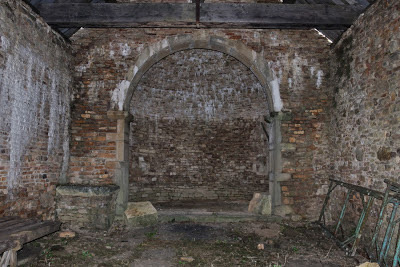 There is not much to tell about the chapel itself. People have started to install roof trusses, and most likely they are waiting for a truck load of subsidy to be able to buy roof tiles. Seek, and ye shall find? 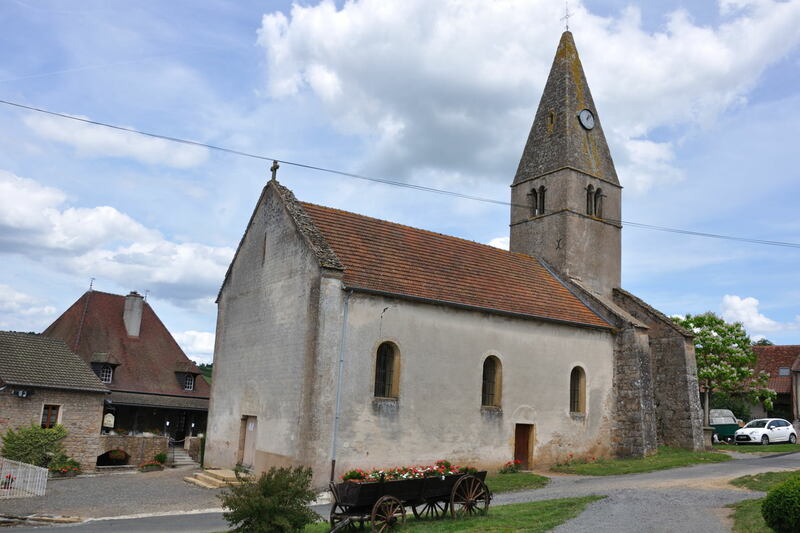 ﻿We have a client in Donzy-le-National, and this village also has a Romanesque church. At first glance it did not look very exciting, but the outside has a few interesting features, and the apse turned out to have some nice arcatures. According to my virtual travel guide Le site sur l'Art Roman en Bourgogne there was another Romanesque church in the hamlet of Ciergues, which is part of Donzy as well. One day, when we were travelling home from this client we noticed that we had passed through this hamlet a thousand times, but we had simply never spotted the sign Ciergues. 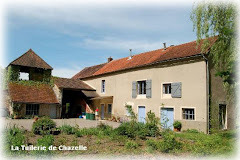 The next time we drove through both of us kept our eyes wide open; there was not much traffic on the D41, and we had all the time to have a good look at the three clusters of houses making up the hamlet. Needless to say that we did not spot anything. 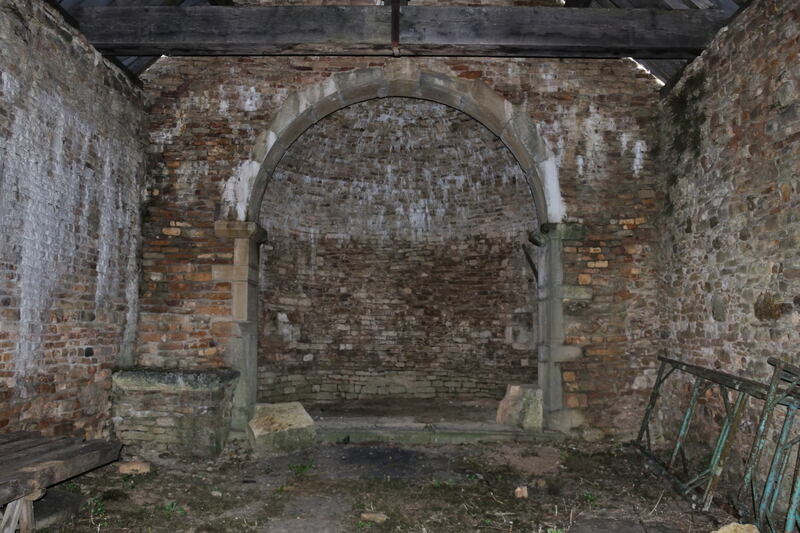 Our walking encyclopaedia came with the following answer : "It is a former church, nowadays in use as storage space. Location unknown, hence I cannot tell you where to look." Well, that was not much use. The following time we stopped at each cluster, got out of the car and snooped around, again without result. No trace of a church to be found. At the last cluster we managed to park on a side road, and fortunately we bumped into somebody there. We explained what we were looking for, and he referred to a farm on the other side of the road. And though the gates were closed I could take some pictures of building and annexes from the road. Just when I wanted to walk back to the car, someone else appeared from a house, asking what I had been doing there. This sort of social control is (fortunately) still well developed around here. After I had explained what we were looking for he told us that we had been looking at the wrong house. 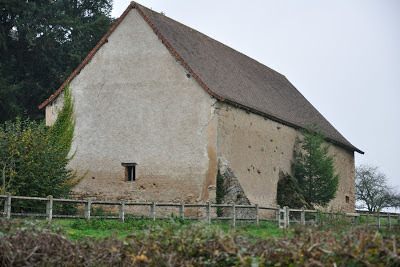 He knew about an old church, now in use as a barn, located in the middle cluster of houses. It was not the first house there, but the second, and it was on the left hand side from where we were standing. 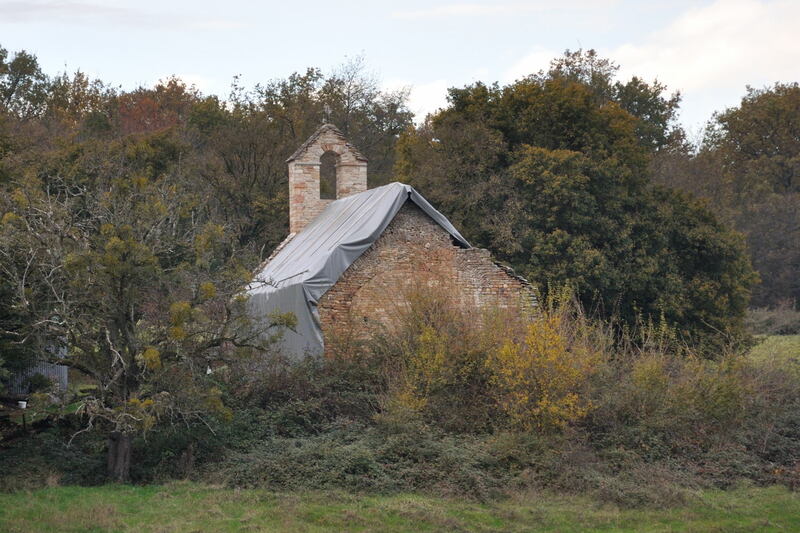 The church was closed during the revolution, and sold to a farmer who turned it into storage space. The man sounded confident and reliable, the story seemed plausible, so off we went again, to the next cluster. 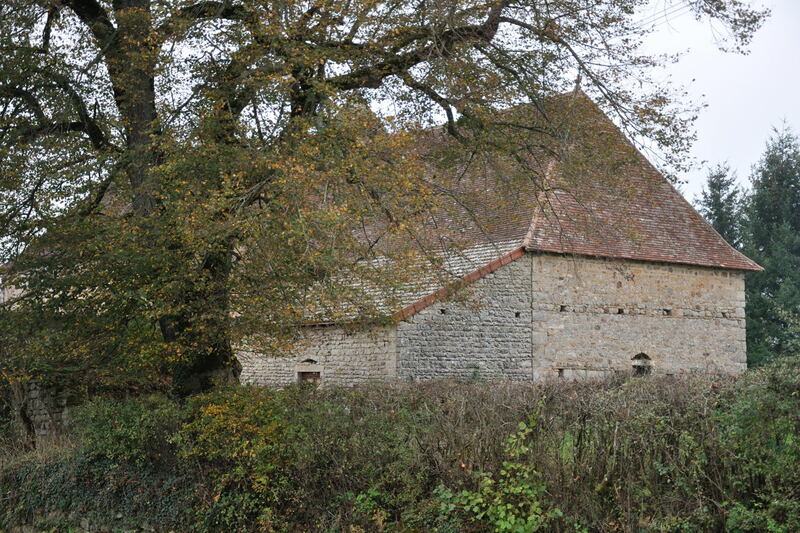 And yes, just visible from the road, we spotted a barn, with buttresses, which could have been an old church. "I had a good look at your pictures. 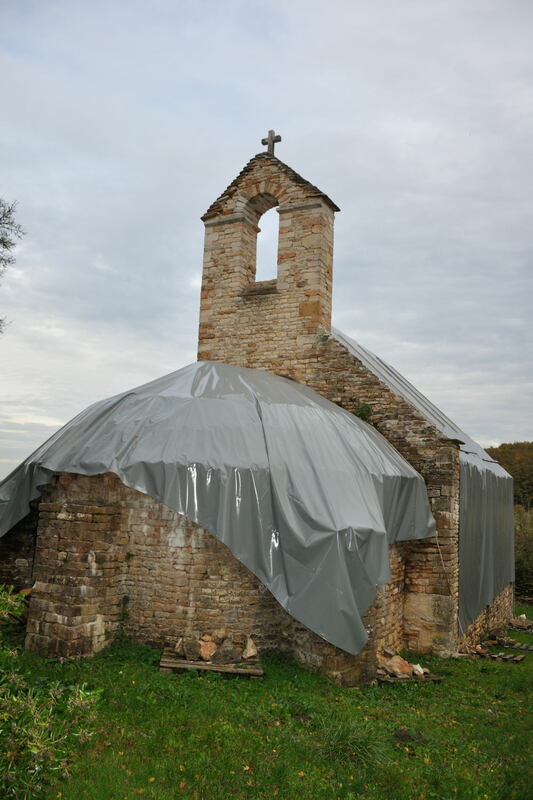 There is no clear indication of Romanesque architecture. The wall in picture 5 (right hand side building) gives me a vague connotation. The same applies for picture 8 (right hand side). The buttresses are not Romanesque, but give the impression of a church. 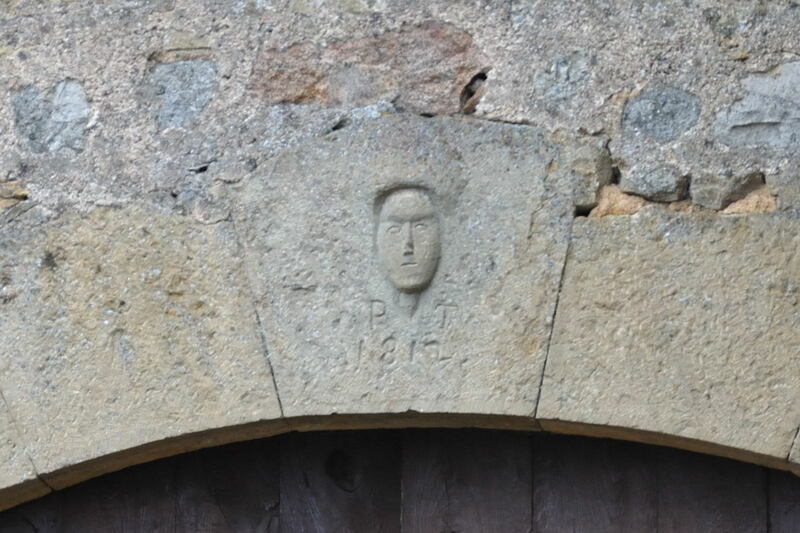 In picture 1 I see a sculptured head above the big gate, which gives me the same impression. It could well be that one of those two buildings is a former church, but I could not tell which one of the two." A picture of the sculptured head can be found at the bottom of this blog. This quest led to nothing concrete, but taught us something we already knew: never trust someone blindly who seems to know something; always try to get hold of a second, and if possible of a third opinion. Remark noted! For a number of pictures of the church in Donzy-le-National, click here.